Whether it is for meat, fish, or vegetables, among others, a charcoal grill will come handy! They add a mouthwatering and smoky flavor that is sure to be a treat! Best of all, you do not need to be an expert to prepare food everyone is sure to love. In this short post, we’ll round up some of our top picks for the best charcoal grills 2019, making it easier for you to come up with the right choice! The mere fact that this is made by Weber can already provide you a compelling reason to pick this charcoal grill over many of its competitors. Luckily, it lives up to its name, especially when it comes to its features, construction, and performance. With a diameter of 22 inches, the cooking area is 363 square inches, which will provide generous space for cooking up to 13 burger patties. If you are looking for portability, this is one product that does not fail to impress. While it is not exactly lightweight, there should not be an issue since it is equipped with two 8-inch rubber-molded wheels. This makes it easy to move it from one place to another. The lid is made of porcelain enamel, which is known for its heat retention. This allows it to maintain a consistent temperature when you are grilling. Lastly, it comes with a strategically positioned temperature gauge, allowing you to easily monitor the temperature. Otherwise, you will have to open the lid frequently and heat will escape. This is the ideal option for people looking for a grill that comes with a generous cooking area. The primary cooking surface is 576 square inches. This is even made better by the fact that it has a secondary cooking area of 240 square inches. With the side shelf, you will have a convenient warming and prep area. 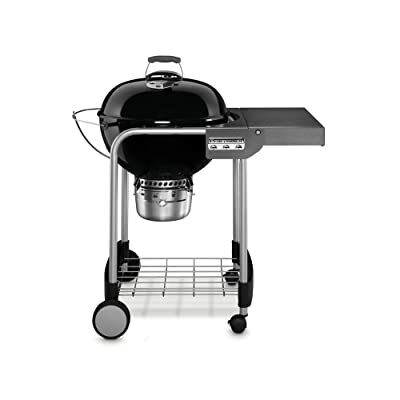 One of the unique features that you will find in this product is the charcoal tray adjustment crank, which allows you to manually take control of the functions of the grill. All that you have to do is to turn the crank to change the position of the charcoal depending on how hot you want the internal temperature to be. 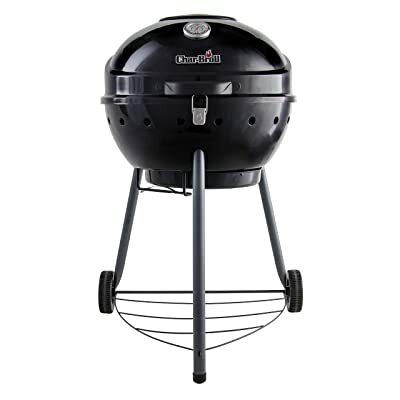 It also has a convenient door that allows you to add charcoal and briquettes while it is grilling. There is no need to open the lid, which means that it will be able to retain the right temperature. The unique shape of this product is one thing that sets it apart from most of its competitors. 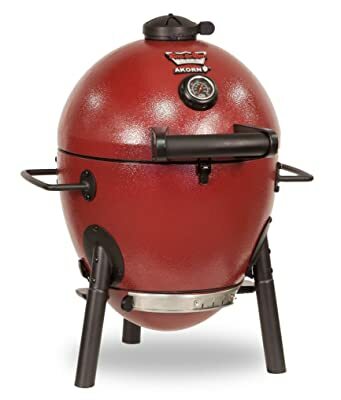 It is shaped like a giant egg, which is what the kamado grill is known for. 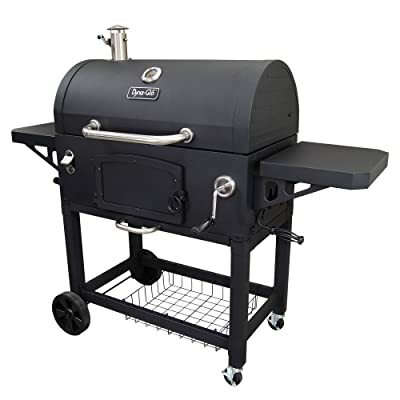 It does not have wheels, but it has convenient handles on the side that will allow you to bring it when camping or tailgating, among other instances when you need to have a charcoal grill. It has a cooking diameter of 14 inches and a total surface area of 153 square inches. If it is too small for you, there is a bigger regular version of this charcoal grill. You will not have difficulty in controlling and maintaining the heat of this grill. There are dampers that will allow you to adjust the airflow. Plus, it has a triple-walled construction, which is the main reason why it is capable of retaining the right level of heat at a maximum of up to 700 degrees Fahrenheit. It has a total of 360 square inches of cooking area, which is more than enough for most applications. However, one of the main problems with the design of this grill is that it does not have shelves on the side. Although, there are handles that can double as hooks to hold your grilling accessories. The hinged lid of this model is also a plus, which helps in making the operation simpler. You no longer have to put the lid on the floor when it is lifted. Lastly, it features the innovative TRU-Infrared Charcoal Grates, an innovation that has been developed exclusively by the manufacturer. This allows you to grill efficiently since lesser charcoals will be needed compared to most of its competitors. The grate is also rust-resistant and designed to prevent flare-ups.